Categories: Lift Operators, Traffic Control. Equipped with a boom, carrying a mesh fence, it is an interesting alternative to a sliding gate, because in addition to closing an access hermetically, it makes it possible to control it, vehicle by vehicle, and in a more fluid way. 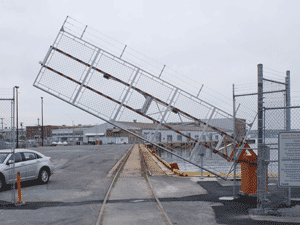 Constructed for commercial and industrial use, the rising fenced barrier is faster than a sliding gate system and can close access to pedestrians, even on a very wide road.